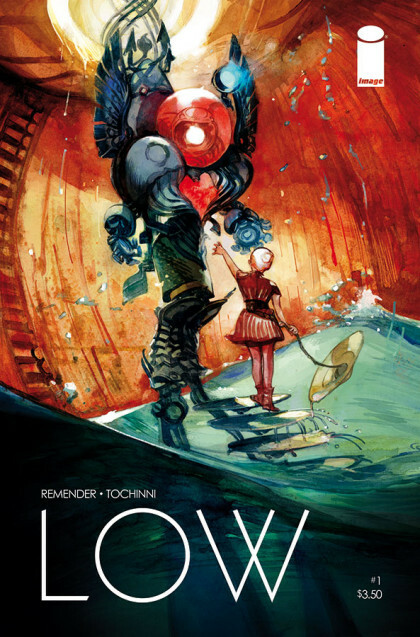 SETH’S PICK:: LOW #1: What I won’t do with this recommendation is to go on and on about why I love Rick Remender’s comics. That’s been done already. What I can do is talk about the concept behind this promising new Image comic. The story is set at the bottom of the ocean, where humanity was forced to go after the sun’s enlargement turned the Earth’s surface into an uninhabitable wasteland. While that alone could offer plenty of interesting stories, the twist is that the remnants of humanity receive notice that one of the probes they sent ages ago to discover more suitable planets finally returned. Unfortunately, it returned to that irradiated nightmare that is the Earth’s surface. With a strong writer and a strong concept, there’s plenty to be excited about in this new series. This time around, however, I’m most interested in seeing the work of artist Greg Tocchini. The multitude of sci-fi and fantasy elements here seem ready-made for his work to flourish in, and the preview pages released strongly reflect that. If you need even more Remender comics this week, don’t forget that his other excellent sci-fi series Black Science also returns this week with issue seven and a new story arc. 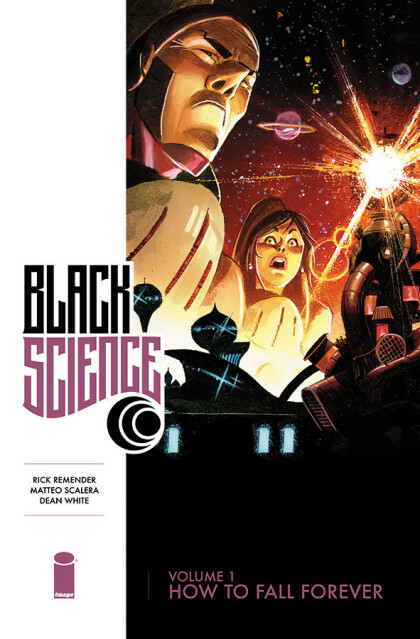 SETH’S PICK :: BLACK SCIENCE #1: If you missed Rick Remender and Matteo Scalera’s run on Secret Avengers, you should treat yourself go back and read it. It was full of imaginative comic craft, and felt unique among the other Marvel comic it stood beside. As memorable as that run was, I wondered what kind of comic these guys would create if they had complete control over it. That question is finally answered this week in the form of their new series Black Science. Conceptually, it’s a sprawling science fiction epic featuring rogue anarchist scientists who break the barriers of reality and find themselves amid an endless amount of alien worlds. This is the kind of big concept Remender seems to relish, but is made all the more interesting by the bombastic art of Scalera. It’s been a while since there was so much early buzz surrounding a new creator owned sci fi series. This book seems primed to not only live up to its hype, but very likely surpass it. Seth Peagler (SP): It’s been a few months since we featured our “Looking Ahead” column. Between HeroesCon, warehouse sales, and traveling to other cons, we’ve all had our hands full. It’s back now, though, and this time a Heroes married couple will be perusing Previews for your benefit. Orders are due very soon, so make sure to get yours in this week! With that, Heather, where do you think we should start? Heather Peagler (HP): Instead of just calling this “Looking Ahead” this month, I think we should call it “Looking Ahead to Heather’s Birthday.” Clearly Marvel and DC knew that I had a birthday in November since they are choosing that month to give me an awesome Nightcrawler return and a Harley Quinn that feels like old times. There’s so much fun stuff to choose from! Just consider all my picks to be a nice birthday list and everyone get to shopping! SP: We all know that comic characters never stay dead. It’s probably no surprise that Marvel is bringing Nightcrawler back now. This resurrection in particular looks promising. HP: BAMF! BAMF! BAMF! 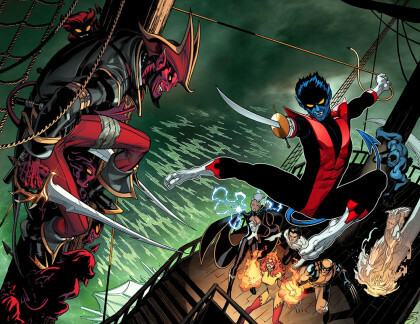 the appearance of a familiar blue visage at the end of Wolverine and the X-Men could only lead to the awesomeness of a pirate Nightcrawler. Jason Aaron should get a huge cookie basket from Marvel for making X-Men so very amazing. Speaking of being amazing, make sure Amazing X-Men #1 by Aaron and artist Ed McGuinness is on your pull list for November! SP: Aaron and McGuinness are a perfect fit to herald Nightcrawler back from the beyond. I’m excited for this as well, but am equally excited that Marvel is collecting the earliest of Captain America’s Golden Age adventures into an omnibus. It’s Joe Simon and Jack Kirby pitting Cap and Bucky against Hitler and the Nazis! You all know how nearly impossible it is to dig up single issues or reprints of these books, so this is an opportune way to finally get these stories if you’re interested in a nice slice of comics history. Along with Golden Age Cap, Marvel is finally bringing their Silver Age Ant-Man stories back into print, via a brand new trade paperback in the Masterworks series. This collection has long been out of print, so here’s your chance to brush up on Ant-Man knowledge before the upcoming Marvel film adaptation. HP: Speaking of issues that are hard to find, Marvel must have gotten my subliminal messages about Chris Giarusso’s Mini Marvels as they have assembled a complete collection for my reading pleasure! It even includes a complete run of Mini Marvel comic strips! This is a great collection for kids and adults alike. Marvel also has a collection that’s the opposite of kid-friendly coming soon with volume 1 hardcover is the latest Deadpool series. 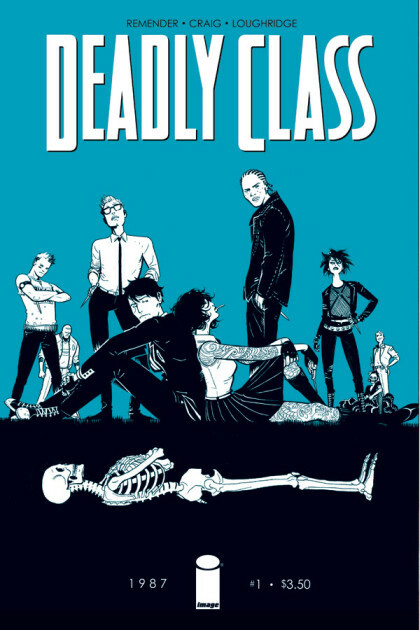 The first twelve issues of this hilarious series by writers Gerry Duggan and Brian Posehn are collected within. SP: Another new Marvel collection I’m looking forward to is the Avengers: The Enemy Within TP by Kelly Sue DeConnick. I’ve enjoyed her take on Captain Marvel, and this collection should please all members of the Carol Corps, official and honorary. HP: Perhaps it is Halloween coming that has me in the spirit for reading the new ongoing series of Ghost by the writing team Kelly Sue DeConnick and Chris Sebela and interiors by Ryan Sook! I really enjoyed the last mini-series and am looking forward to reading more. SP: Along with Ghost, we can’t ignore Dark Horse’s newest horrorific Black Beetle series. 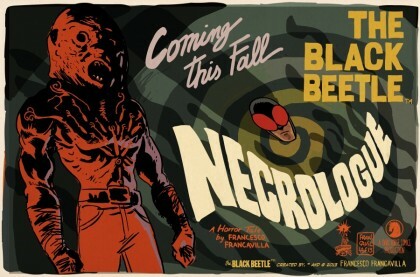 Black Beetle: Necrologue #2 continues the pulpy goodness wrought by Francesco Francavilla, the busiest artist in comics, and features more horror elements than the last mini series. And though it isn’t overtly a horror title, there’s plenty of gruesome genius on display in Geof Darrow‘s Shaolin Cowboy #2. I’m thrilled that Darrow found time to bring Shaolin Cowboy back to the masses, and this series’ inclusion of zombies makes it a perfect accompaniment to Dark Horse’s other ghoulish November titles. HP: Over at DC there’s Harley Quinn! I absolutely adore Harley Quinn, or the early version of her anyway. I yearn for the days of Mad Love Harley and do so miss her looniness. I have great hope for Harley Quinn #0 to return to old school Harley and give readers back that cute and quirky homicidal maniac missing from the current pages of DC. The creative team lends itself to the fun of Harley with artists like Darwyn Cooke, Walter Simonson and Art Baltazar all contributing. If you share my love of Harley be sure to check out all the new t-shirt offerings on page 421 of Previews! I want at least three of them! SP: Trust me, folks, she’s not kidding about wanting that many Harley shirts. I think fans of all ages DC stories should enjoy the new Scooby Doo Team Up series. Issue #1 features Batman and Robin, so if you have a young reader in the house, or are yourself a young-at-heart reader, don’t forget this one. HP: That Scooby Doo Team Up series reminds me of the old cartoon when everyone from the Harlem Globetrotters to Sonny and Cher to Jonathan Winters would show up and take part in the hi-jinx! If it wasn’t for those meddling kids!! Speaking of kids, is it ever too early for love to be in the air? Especially when that love is expressed as A Very Vader Valentine’s Day? With art by Katie Cook, the adorable book with 36 valentine card is sure to be loved by both the kids and Star Wars fans in your life. SP: November definitely looks to be an especially kid-friendly publishing month. 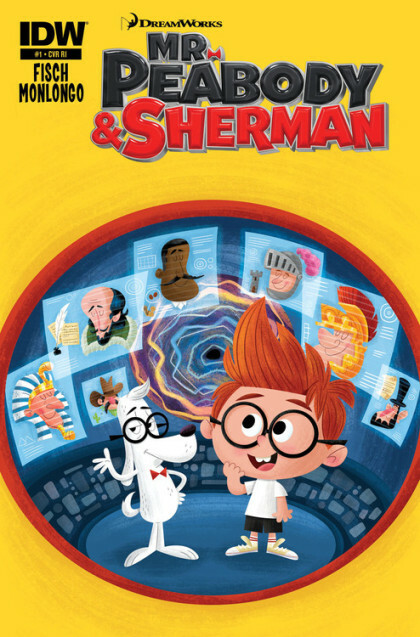 Along with the new Scooby Doo title, there are debut issues of Ben 10 and Mr. Peabody and Sherman, and a new stand alone graphic novel in Adventure Time vol. 2: Pixel Princesses. 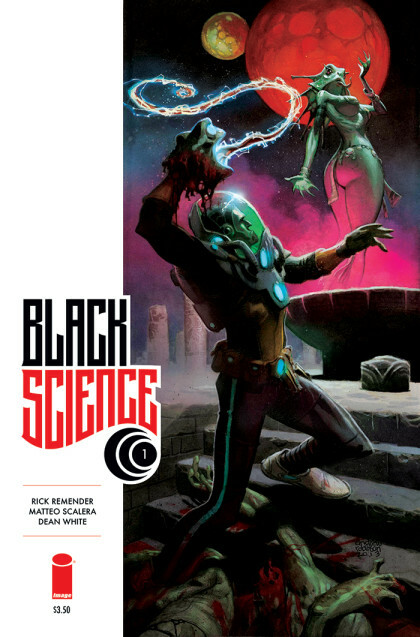 But if I was forced to pick a book of the month, I’d have to go with Image’s Black Science #1. 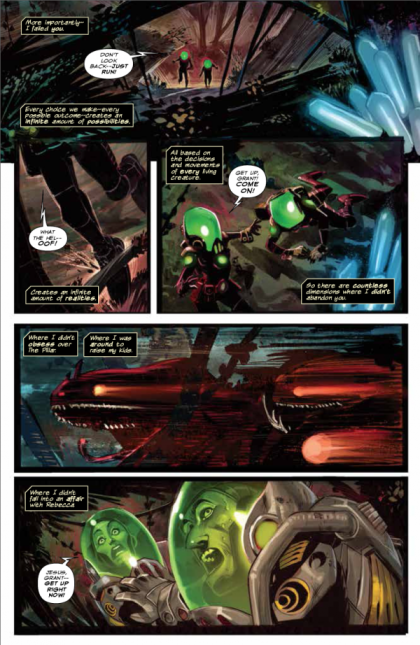 Not only does it mark Rick Remender‘s return to Image, but re-teams him with talented collaborator Matteo Scalera. You can ascertain that the series focuses on dark science fiction, but I have a feeling this is going to be not only a big seller, but a critically acclaimed book. That means that like Saga, the first several issues of this series might move quickly. Get in on the ground floor with the first issue in November. Remember to let Justin (justin@heroesonline.com) or any of the store staff know what you’d like from Previews, and we’ll make sure you get your books!